Austin, Texas – TEKVOX, an innovative supplier of audio/visual control solutions, announced today the TEK-UT, a special edition of its popular TekMonitor™ intelligent room controller, that performs dynamic transcoding of an RS232 command/control stream from one device format to another in real-time. The process of transcoding involves taking in a stream of information in one format (the source) and dynamically transforming it into an entirely different format (the output). Since it may be impractical or cost-prohibitive to reprogram a legacy control system to control a new display or projector, externally transcoding the old control stream to the new device’s format opens new opportunities for owners of legacy systems and the integrators that support them. 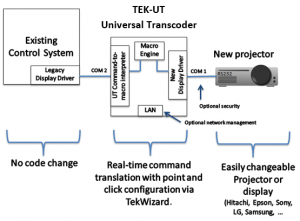 Setting up the TEK-UT for transcoding involves using TEKVOX’s graphical wizard tools to select an input driver corresponding to the original display’s control codes and then selecting an output driver corresponding to the new device’s control code and assigning macros to mapping input codes to output codes. The TEK-UT kit is available now through authorized TEKVOX dealers and resellers and has a single unit MSRP of $325.